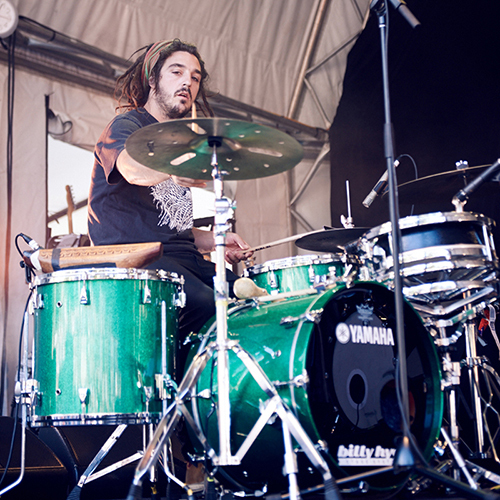 Perrin Moss is a self-taught drummer and producer from the Blue Mountains, Australia. Moss acts as producer / drummer for Melbourne neo-soul outfit Hiatus Kaiyote, signed to Flying Buddha Records, an imprint of Sony Music by Salaam Remi (Amy Winehouse, The Fugees, Nas, Miguel). A collaboration on the track ‘Nakamarra’ with A Tribe Called Quest legend Q-Tip on their re-release of debut self-produced record Tawk Tomahawk earned Hiatus Kaiyote a Grammy nomination for Best R&B Performance, making Australian history as the first Australians to be nominated for any R&B category. In addition to Hiatus Kaiyote, Moss has a side project Clever Austin, a nine-piece instrumental group playing original productions. Moss is currently touring with Hiatus Kaiyote across most parts of the known world, in aid of their first full length album Choose Your Weapon (out May 2015).